The American venture capital firm, Ribbit Capital is aiming to raise $420 million for its latest fund. Ribbit Capital, which includes some of the big crypto and Blockchain projects in its portfolio, is raising money for its fifth venture capital fund. This venture will be raised with limited partners and will be a nominal increase from the $300 in funds raised in 2017. Ribbit’s portfolio is comprised of industry leaders such as Coinbase, Robinhood, Credit Karma as well as Root Insurance. The venture capital firm has in turn invested in Andreessen Horowitz, Cross River Bank and Battery Ventures. The Financial Services Agency (FSA), Japan’s financial regulator is planning to expand the size of the team that is focused on crypto-related matters. This is being done so that the agency is able to better handle the growing number of applications from Japanese companies for cryptocurrency exchange licenses. The FSA stated that it currently had a team of 30 people who were working on crypto-related activities which included license registration reviewing. The FSA’s Vice Commissioner for Policy Coordination Kiyotaka Sasaki stated that they were planning to add another 12 members to this team. The Chow Tai Fook Jewellery Group based in Hong Kong is going to start using a Blockchain powered platform to track diamonds. The company reportedly put some of its diamonds on the Blockchain platform that was created by Everledger and secured by IBM’s Blockchain Platform. This way, Chow Tai Fook’s customers will be able to check the origins as well as authenticity of the diamonds they buy. The retailer’s stores and called T Mark, and a new app by the same name is being developed to support this Blockchain. Thus, customers can use the T Mark app to check the quality of their diamonds. 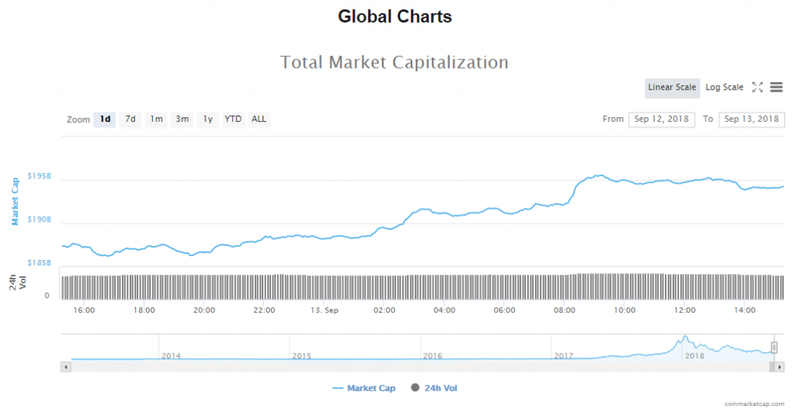 The crypto market’s volumes went up by another $0.36 billion to $11.86 billion. 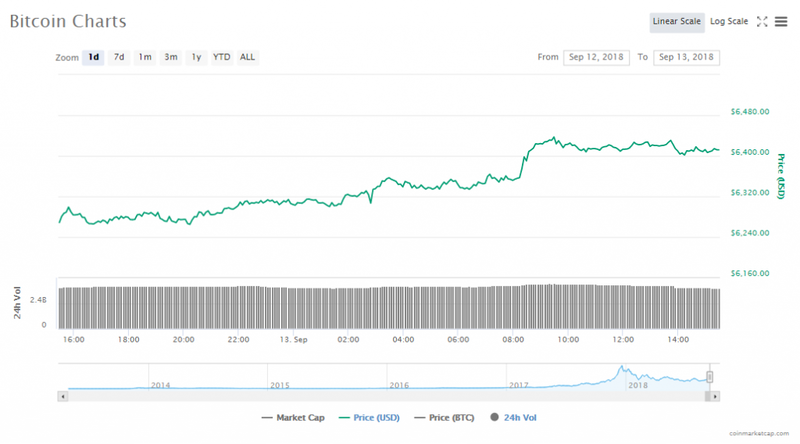 The value of the crypto market as a whole is $194.42 billion gaining by $5.05 billion in the last 24 hours. Bitcoin’s current token price is $6411.92, a slight 1.79% increase since yesterday. 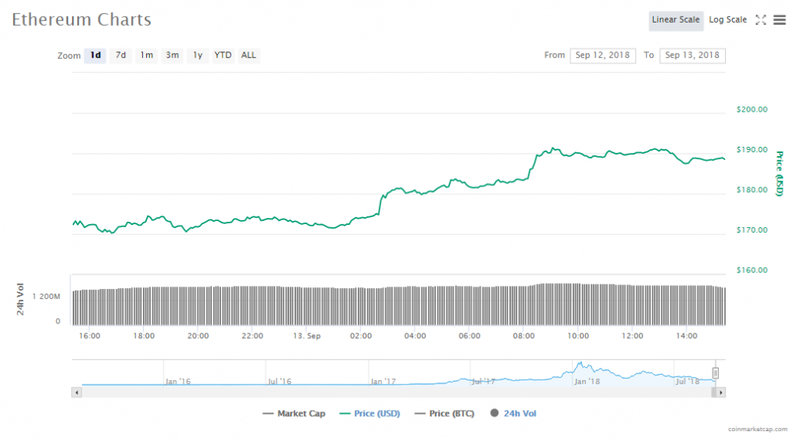 The market cap of BTC is $110.75 billion and volumes went down slightly to $3.83 billion. Ethereum’s current token price is $188.56, which is a 6.23% gain since yesterday. The digital token’s value is $19.17 billion with trading volumes of $1.80 billion. Monero overtook Cardano to the number 9 spot on the top ten list of cryptocurrencies. The list is currently mostly green, with only Tether showing a slight 0.5% dip in trading price. All the other cryptos are currently in the green, with the biggest gains seen by Ethereum, which is up by 6.23%. The next big gains are by Stellar, which has gained 5.81%. Bitcoin is trading at $6411.92, rising 1.79%. The crypto is now valued at $110.75 billion. Ethereum is trading at $188.56%, rising 6.23%. The crypto is now valued at $19.17 billion. Ripple is trading at $0.269596, rising 4.13%. The crypto is now valued at $10.70 billion. Bitcoin Cash is trading at $435.85, rising 2.89%. The crypto is now valued at $7.56 billion. EOS is trading at $4.97, rising 2.40%. The crypto is now valued at $4.5 billion. Stellar is trading at $0.201796, rising 5.81%. The crypto is now valued at $3.79 billion. Litecoin is trading at $52.53, rising 5.60%. The crypto is now valued at $3.06 billion. Tether is trading at $0.999886, falling 0.5%. The crypto is now valued at $2.75 billion. Monero is trading at $106.51, rising 5.77%. The crypto is now valued at $1.74 billion. Cardano is trading at $0.066291, gaining 3.44%. The crypto is now valued at $1.71 billion. The US House of Agriculture Committee, chaired by US Texas Representative Michael Conaway, conducted a public hearing on July 18 whose focus was cryptocurrencies. Six eminent witnesses were called in to give testimony, all of whom agreed that cryptocurrencies complicate existing regulatory frameworks.